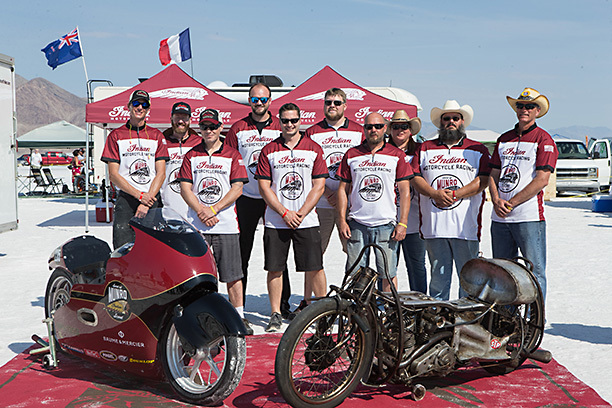 BONNEVILLE, UTAH (August 17, 2017) – Indian Motorcycle kicked off the 69th annual Bonneville Speed Week by paying tribute to the 50th anniversary of Burt Munro’s historic land speed record. 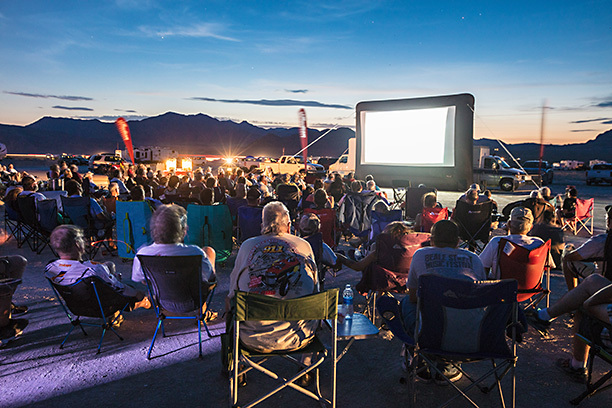 America’s first motorcycle company capped off the weekend with a moonlit screening of The World’s Fastest Indian under the desert sky for Speed Week campers. The film, starring Sir Anthony Hopkins, immortalised Burt Munro and the historic under- 1000cc world record run of his 1920 Scout Streamliner in August of 1967. 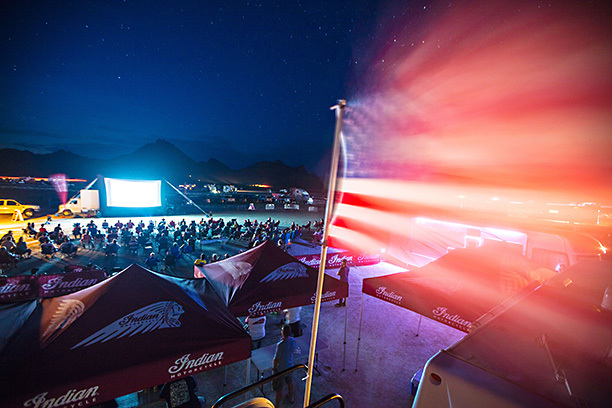 Prior to its special commemorative screening on the Bonneville campground, the film’s director Roger Donaldson and Burt’s son and grand nephew, John and Lee Munro, shared anecdotes about the making of the film, and the impact Burt’s achievements have had on Indian Motorcycle and motorcycling in general. “I’ve seen the movie countless times,” Reid Wilson, Indian Motorcycle marketing director said. Indian Motorcycle teamed up with Kiwi road racer Lee Munro, great nephew of Burt, to celebrate the 50th anniversary and recreate the historic run during the 69th annual Speed Week. A team of engineers worked overtime to create and refine Lee’s “Spirit of Munro” Motorcycle, a modified and partially streamlined 2017 Scout. The team’s goal was to match Burt’s land speed record of 184 MPH to fully pay tribute to his run. 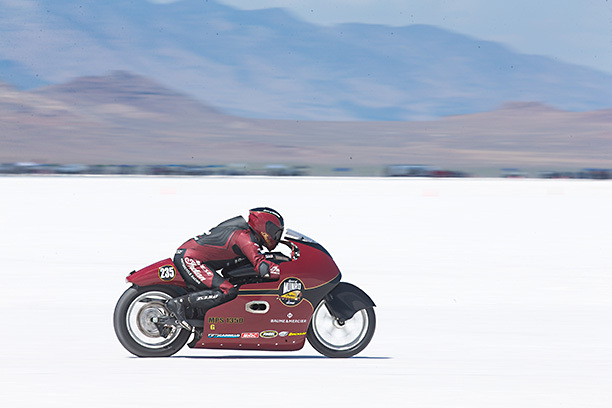 To qualify for Bonneville, Lee achieved his speed licenses through runs at El Mirage Dry Lakebed in California, while even securing a land speed record of 186.681 MPH in the MPS-G (Modified Partial Streamliner) 1350cc class during his rookie run and surpassing the team’s original goal. 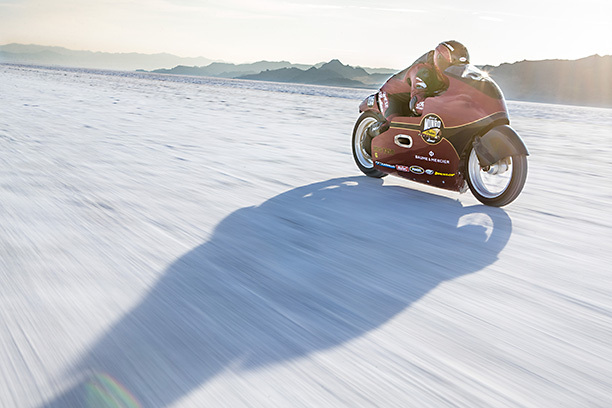 Entering Bonneville, the team’s new goal was to eclipse the 200 MPH mark. However, Lee’s runs proved to be a battle against the elements. Lee attempted his first two runs on the five-mile short course, resulting in his top performance of the weekend at 191.28 MPH and an unofficial run due to timer technical error. The following day, Lee and team made gearing changes and took the modified 2017 Indian Scout out on Bonneville’s nine-mile long course. Unfortunately, high winds and rough overall conditions hindered the motorcycle, resulting in 186.415 MPH in his lone run of the day. “It was my greatest honour to represent Indian Motorcycle in such an incredible tribute to my great uncle on this historic 50th Anniversary,” Lee said.